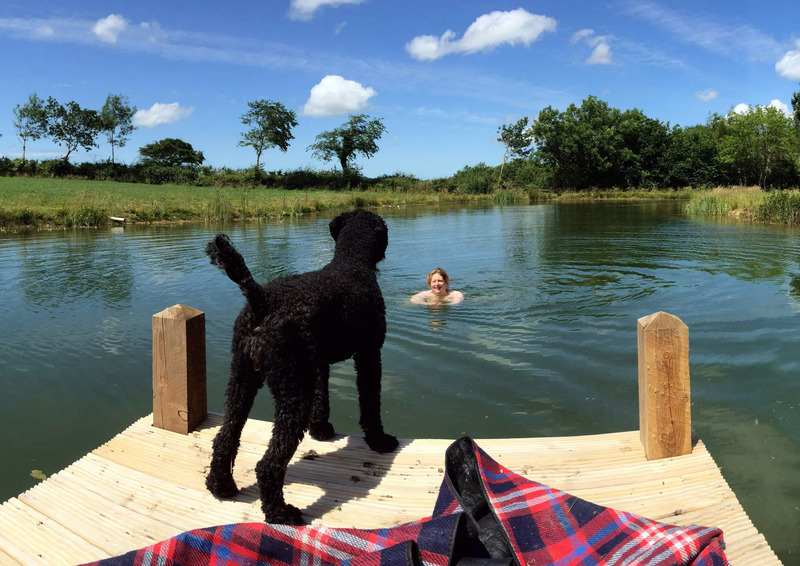 Luckaborough glamping is all about the luxury of space in nature. 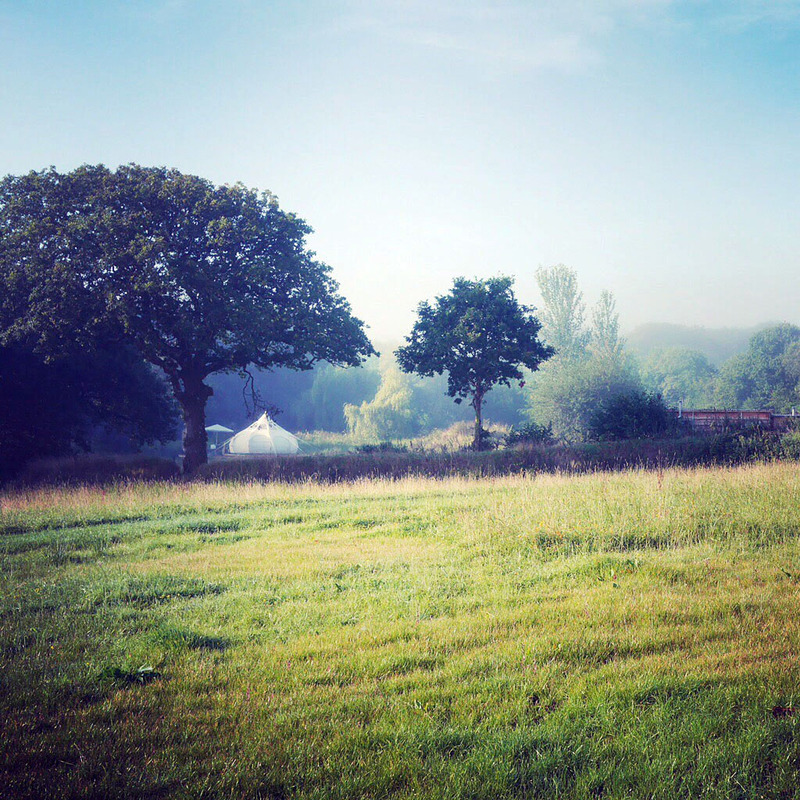 Rather than packing tents in like sardines, we have given each of our pitches several acres of land, allowing our guests the space and privacy to run wild. 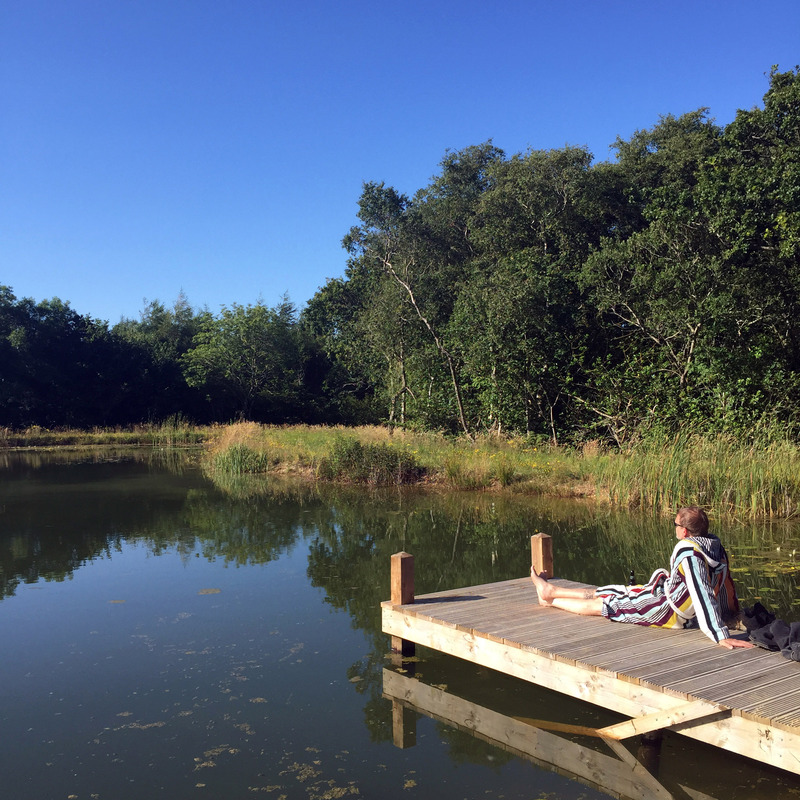 Through the provision of firepits, a swimming lake and 7 acres of private woodland, we encourage our guests to re-engage in the nostalgic joy of mucking about outdoors. We feel passionately about living as sustainably as possible and pour our hearts into our own efforts as smallholders and wildlife conservationists. 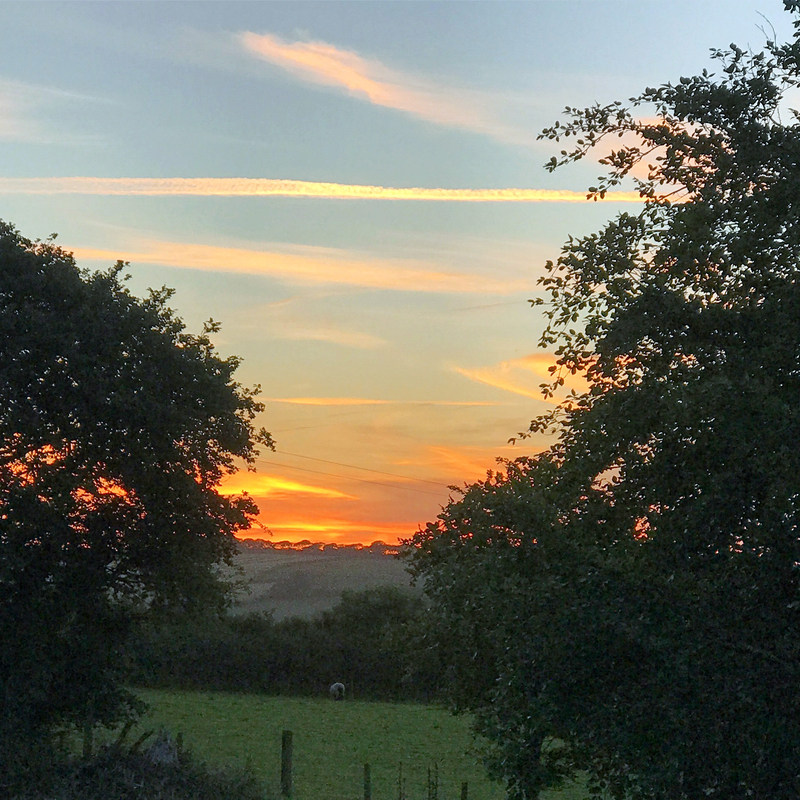 Our long-term goal is to create an environment where a great diversity of wildlife can flourish in harmony with the campsite and our smallholding. It would be our greatest delight if our guests go away having experienced a slice of that good life with us. A big part of our own enjoyment of Luckaborough is the opportunity it has given us to slow down and experience the contentment of concentrating on the task at hand. 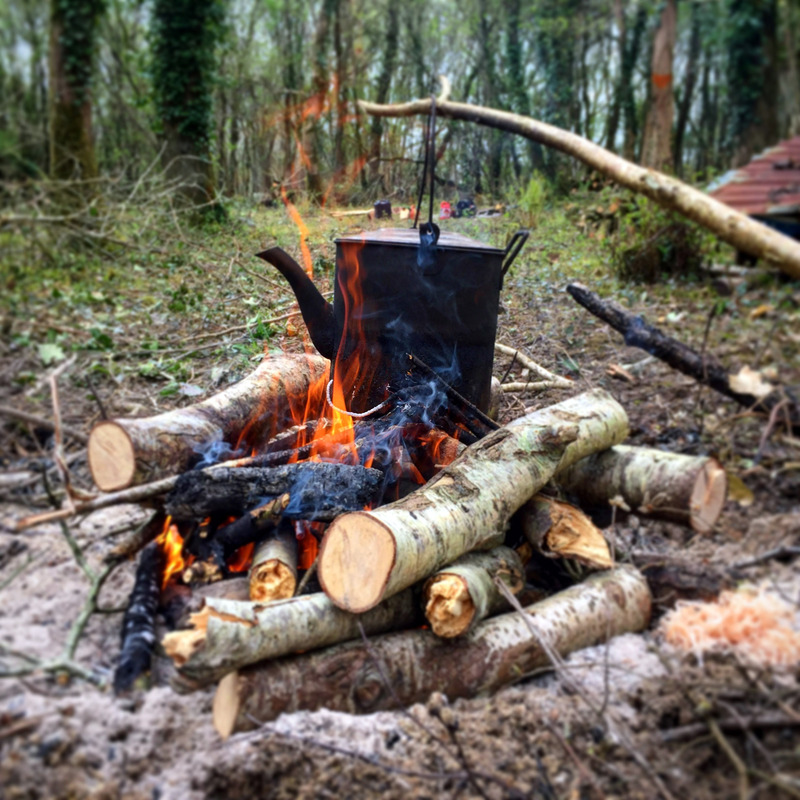 Whether it’s cooking on a campfire, brewing tea in the woods, building a fort, finding bugs, hugging trees, doing an art project, napping, swimming or just listening to the birds, we genuinely hope you can experience the same sense of peace and contentment during your stay at Luckaborough that we have come to enjoy ourselves over the years. Justin and Emma Peer-Norton have nearly 30 years experience in the film business between them. Ems credits as VFX Producer include: Black Hawk Down, the Harry Potter films, Edge of Tomorrow, Cinderella, Tarzan and Wonder Woman. Jays credits include the Potter films, X-Men, Fast and Furious, World War Z, Jason Bourne and also Wonder Woman. The glamping plan came about five years ago. Having realised that their increasing obsession with Hugh Fearnley-Whittingstall’s TV show, River Cottage, was perhaps indicating a lifestyle change was necessary, they began to plot a move to the countryside. But how to do it? 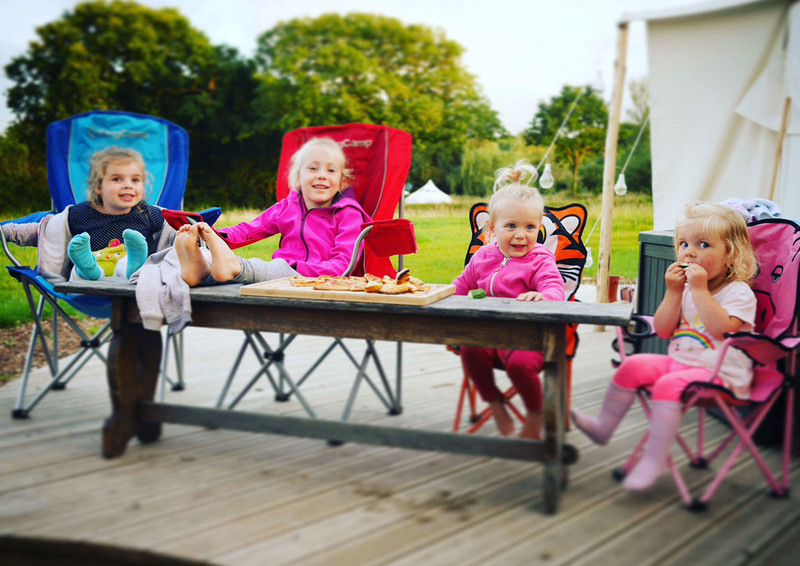 It was a weekend glamping trip that gave them the lightbulb moment. 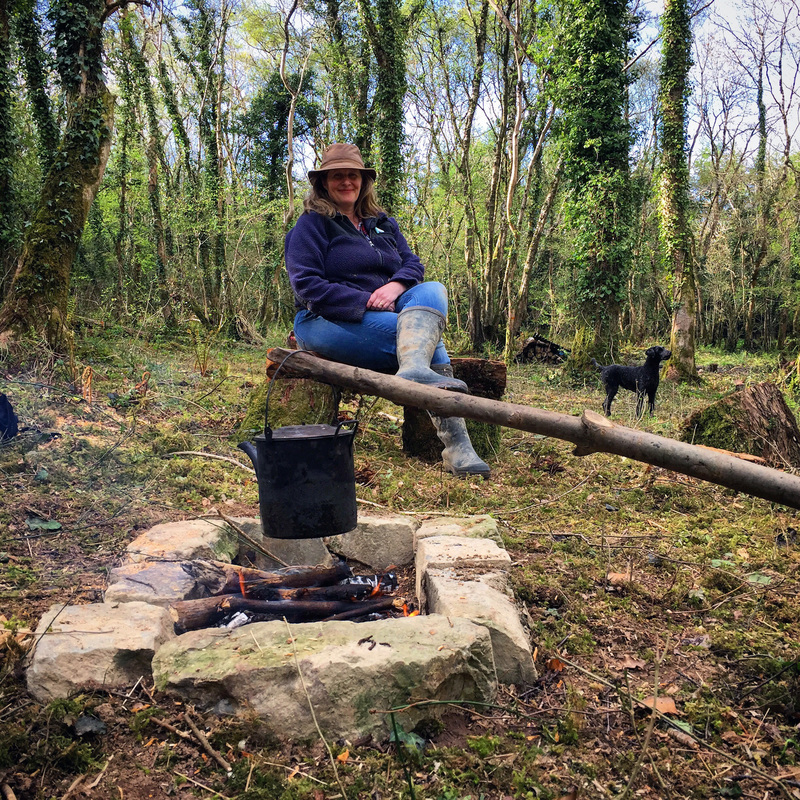 After a hugely enjoyable couple of days sleeping on a comfortable bed under canvas, cooking on the firepit and probably drinking one bottle too many, they worked out a business plan for a glamping site on a scrap of paper and the touch paper was lit. One week later the London flat was on the market. 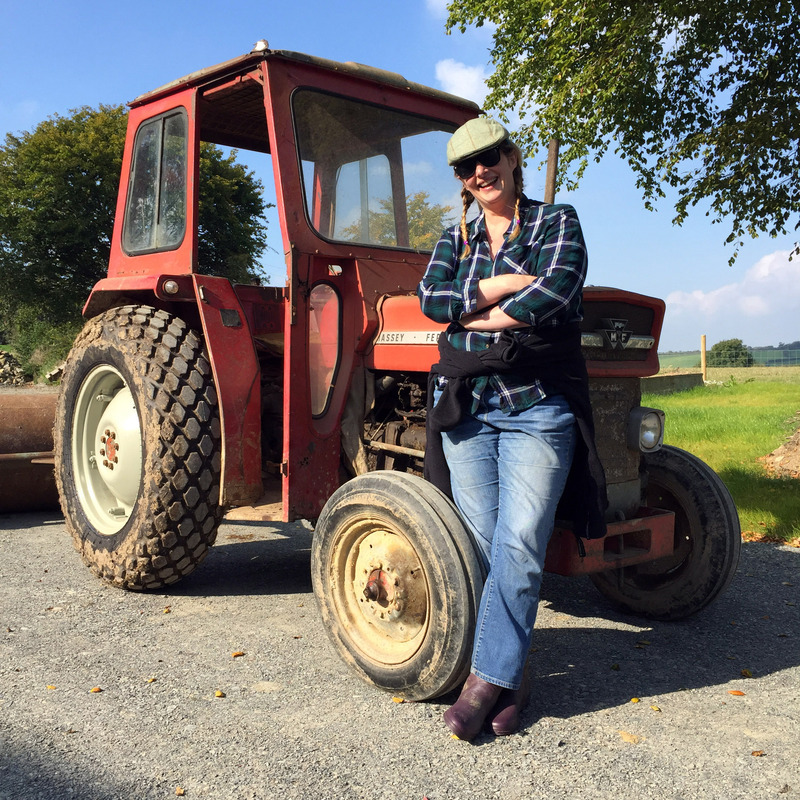 One year after that (almost to the day), they picked up the keys to Luckaborough Farm. And now, four years later, Ems and Jay live full time at Luckaborough with their two dogs, Fraggle and Muppet, several chickens and the odd pig or two. 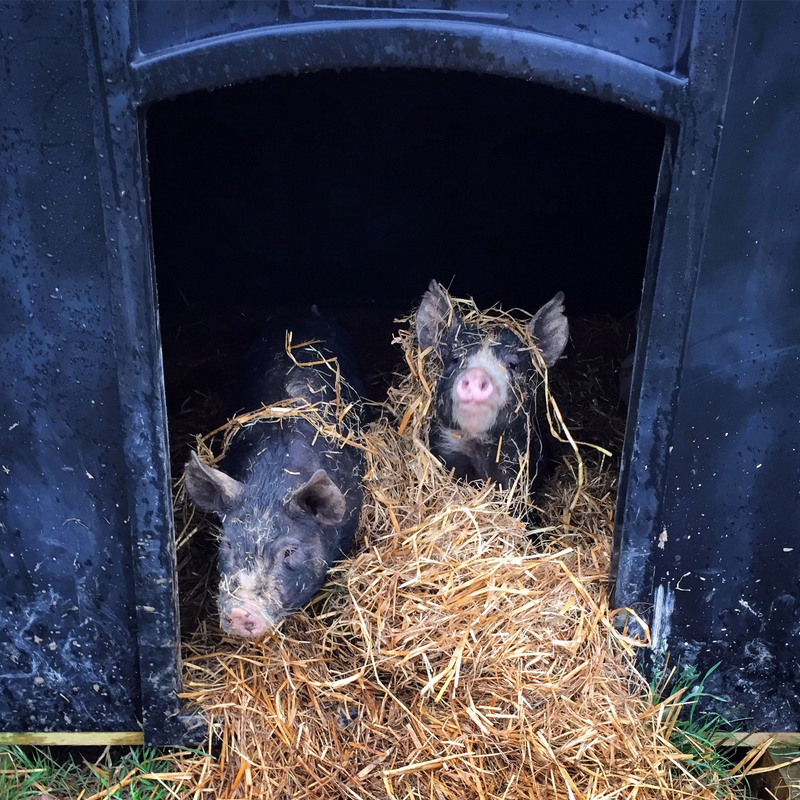 They run the campsite, work the smallholding and often goof off to muck about in the woods. We can add an additional baby / toddler cot and a single camp bed to both the Yurt and the Stargazer. All accommodation is self-catering and we provide everything that’s needed for cooking and living including: linen, towels and fully stocked kitchenettes in all pitches. There is a central shower and washblock, as well as a private, wood fired hot tub at each pitch. The first load of wood is provided free, with each subsequent wheelbarrow full charged at £5. We will make last minute bookings for single nights if available on the day. Sorry, we don’t do hard-standing / hook-ups for caravans, or allow pitch-your-own tents or camper vans into the camping fields. The only pitch with electricity is the Shepherds hut. The tents are all off-grid, but there is electricity at the central shower and washing up block. We provide key lockers with built in USB and plug socket charging points for your devices. There is an information pack in each tent with lots of good suggestions for things to do, where to eat and how to get to various places. We will also post daily weather reports, and notices of events at the washblock. All pitches are self-catering and contain individual kitchenettes with small gas ovens and hobs (electric in the case of the Shepherds hut). The kitchenettes are fully stocked with all the pots, pans, utensils and tableware you should need for cooking. The contents of each pitch are listed in downloadable PDFs on the useful information page. As well as the little ovens in the kitchenettes, you can also cook on the fire-pits, which have griddles and pots that hang over the flames. Trust us, it’s dead easy and brilliant fun! However, if you would prefer there is a communal charcoal BBQ and we can sell you bags of charcoal at the house. For convenience there is also a communal microwave in the wash-block. We are well served by the shops in the local towns of Torrington and Barnstaple. Or you can order food deliveries from Sainsbury, Tesco and Waitrose. If you intend to order a food delivery, it is worth noting that due to our rural location, the supermarkets only deliver on certain days and you should book well in advance of your arrival to save disappointment. 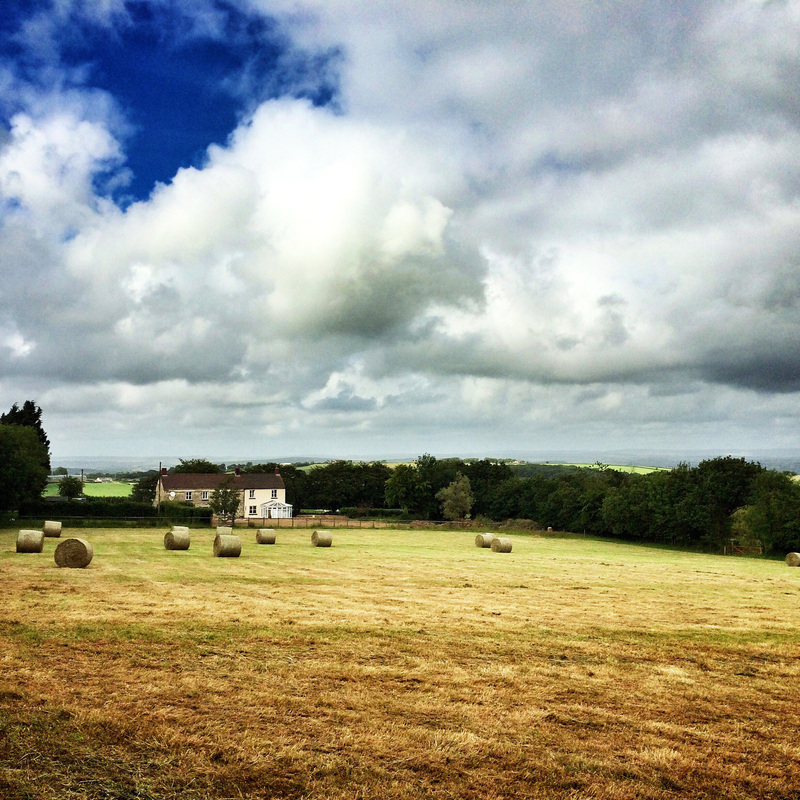 The delivery address is Luckaborough Farm, Yarnscombe, Barnstaple, EX31 3NF (Tel: 01769 560 135). We share a postcode with our neighbours 50 metres up the road, so it’s worth telling your driver to look out for the wooden gate at the top of the drive, with the sign that says ‘Luckaborough Glamping’ to save confusion! If the food delivery arrives before you do, then we will put your shopping into the communal fridge in the wash block. If you are going to arrive too late to organise food on your first night, then we are happy to provide a first night hamper containing: milk, fresh baguette, cold cuts (*we could omit these for a reduction of £5), selection of local cheese, fresh ground coffee (tea bags are provided as standard in all pitches), honey or marmalade, a bottle of wine or non-alcoholic drink and chocolate for £40. (48hrs notice required). For special occasions we are happy to organise for a cold bottle of champagne (£40) or non-alcoholic sparking option (£10) and / or a special flower arrangement (£30) waiting for you on arrival (48hrs notice required). If you don’t want to cook in your pitch, then we are also very well served by the local pubs and restaurants. 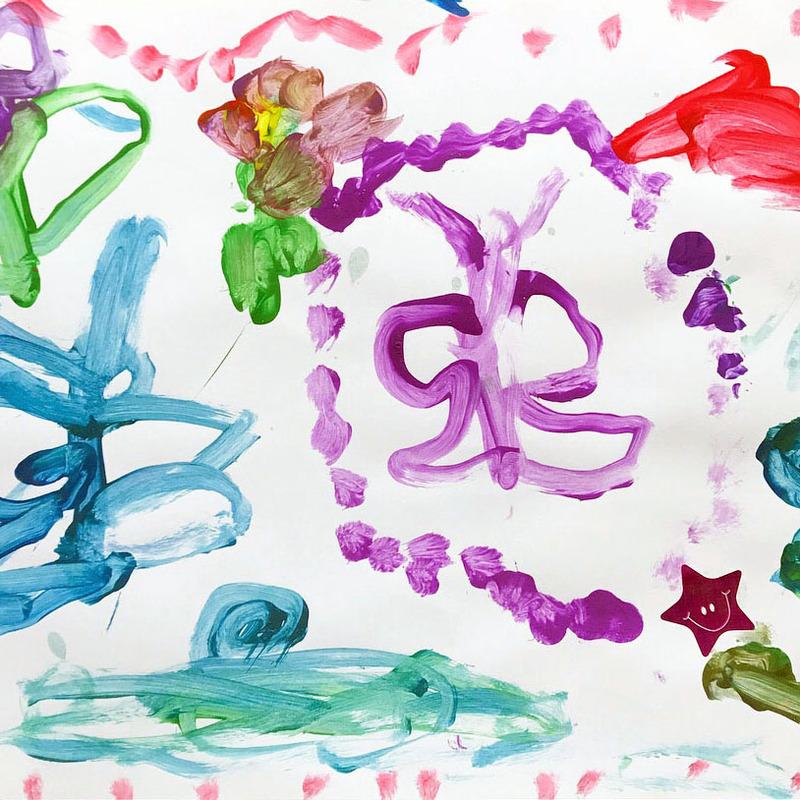 Details of which can be found on our LOCAL page and also in the welcome pack. All tents have general rubbish and recycling bins, which we will empty regularly. We ask that everyone please take recycling as seriously as we do for the duration of their stay. Full recycling instructions are in the information packs. The central wash block has two shower cubicles with gas-powered heating giving you instant hot water all day long. Clean towels are provided on your arrival – if you need to change them during your stay, just come to see us up at the house. Next to the shower cubicles is the flush toilet for everybody’s use, which runs on our treatment plant. The Yurt and the Shepherds Hut also have their own private composting loos. The washing up room beside the showers, contains two washing-up sinks (one inside, one outside), with washing-up liquid, scouring brushes and drying towels provided. The tea towels are changed regularly for clean ones. In the wash block you will also find a communal washing machine, fridge freezer and microwave. We provide non-bio washing up tabs for the machine and the freezer is stocked with lots of re-usable freezer blocks for your ice boxes. You will also find the key-lockers with charging points for your devices beside the fridge. 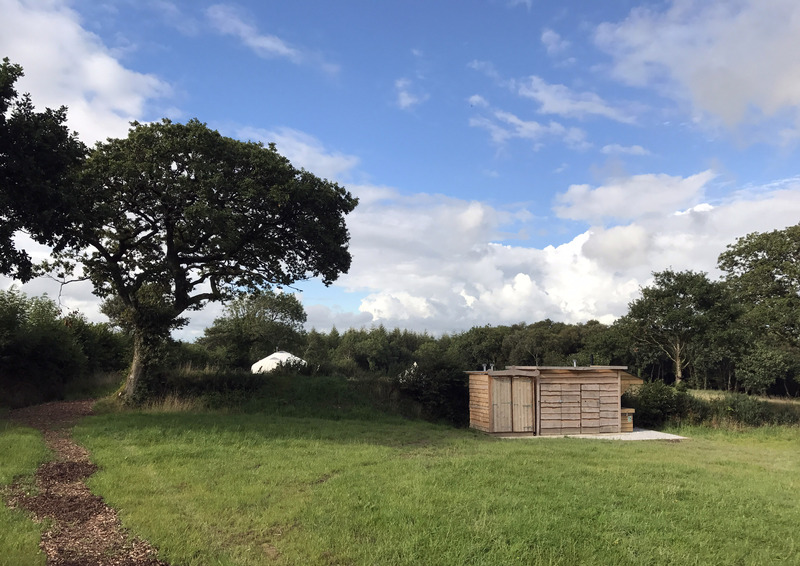 Please note, the wash block is the only place on site that has electricity (apart from the Shepherds Hut of course), so this is where you will also find plug sockets for hair dryers. 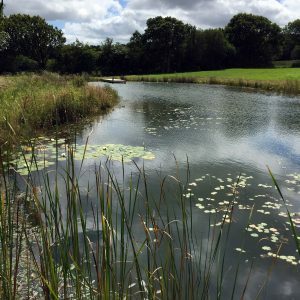 We have a beautiful swimming lake, that is lined with clay and fed by fresh spring water. It is roughly 7ft deep all the way through, with sharply shelved banks and a pontoon for entering and exiting the water at one end. The water is very clean thanks to the fresh spring feeding it and the rushes we have planted to keep it that way. 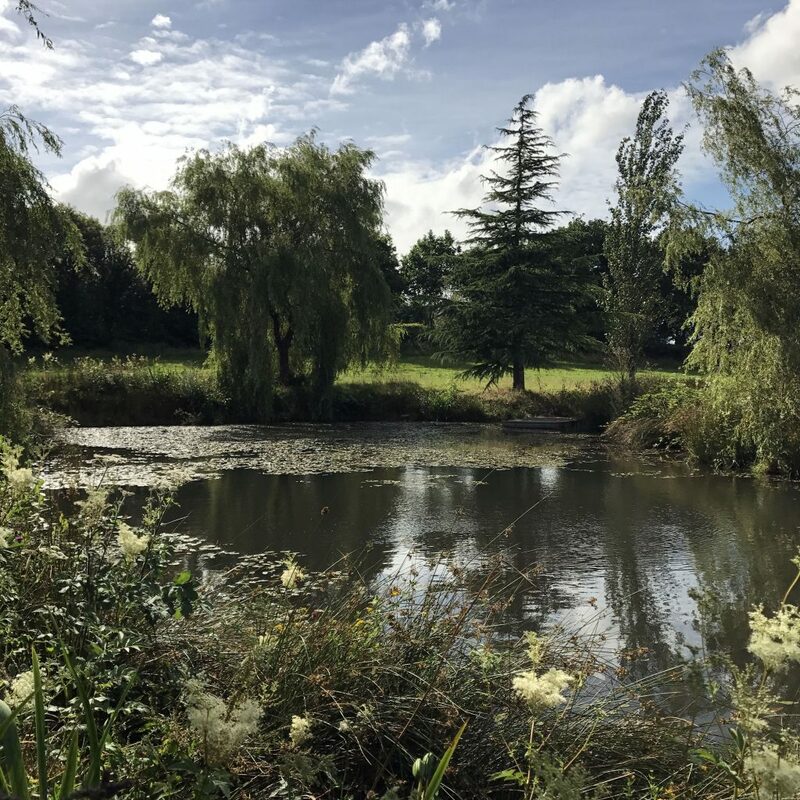 There are no fish in the lake, but there are plenty of frogs, newts, dragonflies and other pond wildlife. Everybody staying is welcome to swim in it as long as you follow the rules stated in the rules section below ( a copy of the rules surrounding the swimming lake are also found in your welcome booklet). Tucked behind the Stargazer pitch you will also find the much older nature pond. This is purposefully quite overgrown and wild as we want to encourage any wildlife that relies on such ponds for their living. There is a pontoon at one end, so you can walk out on to that to take a look. But, as the depth of water varies from 1 ft to 12 ft at it’s deepest, this pond is definitely not for swimming in. 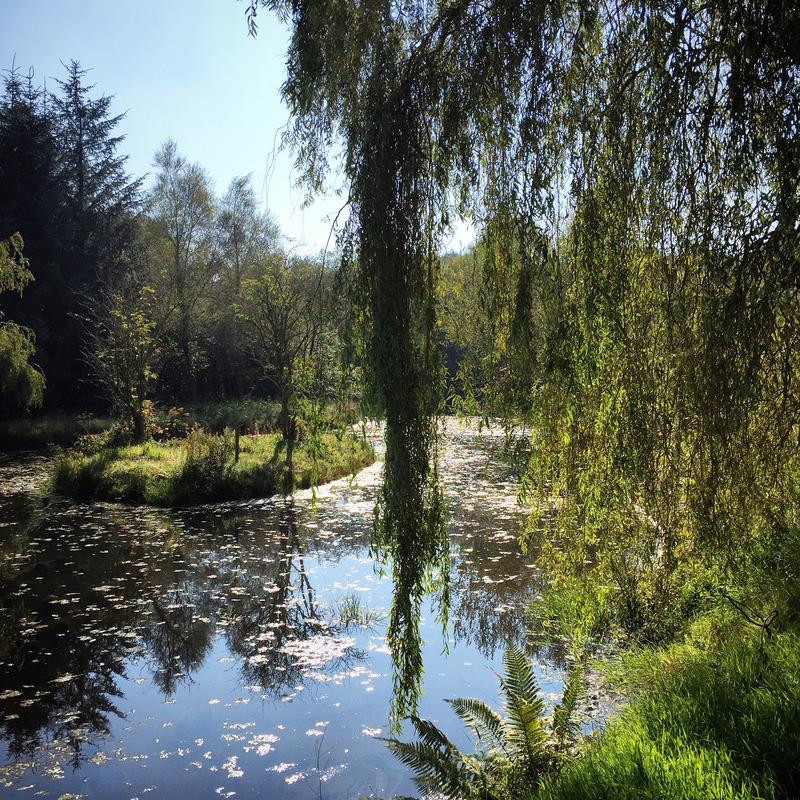 It is however, a great place to go and sit peacefully and watch for pond life. 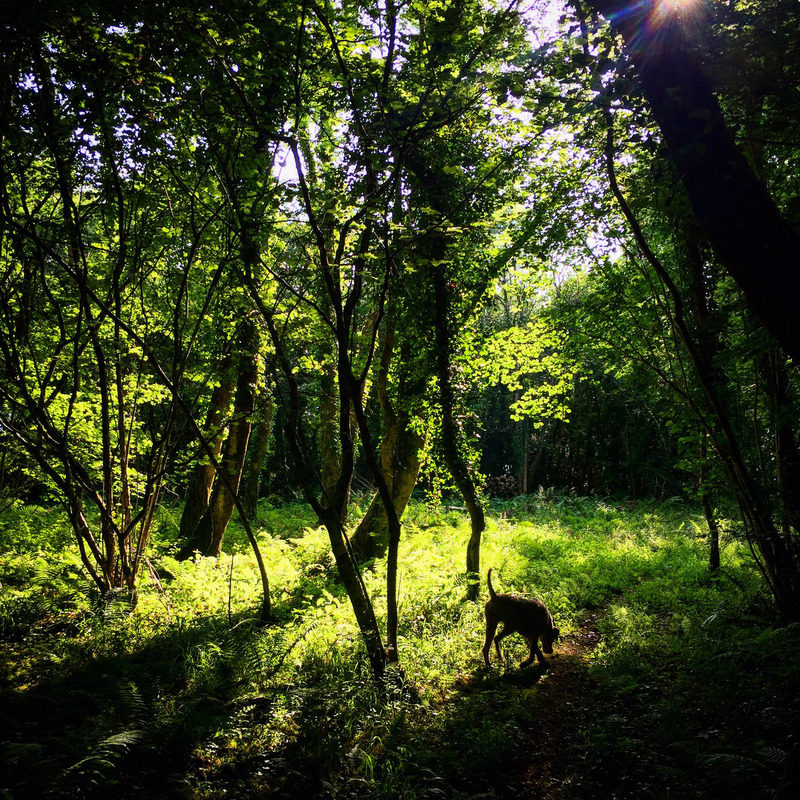 We are lucky enough to own 7 acres of completely private woodland, stuffed with an abundance of wildlife including badgers, fox, deer, rabbits, owls, buzzards and a multitude of other creatures. 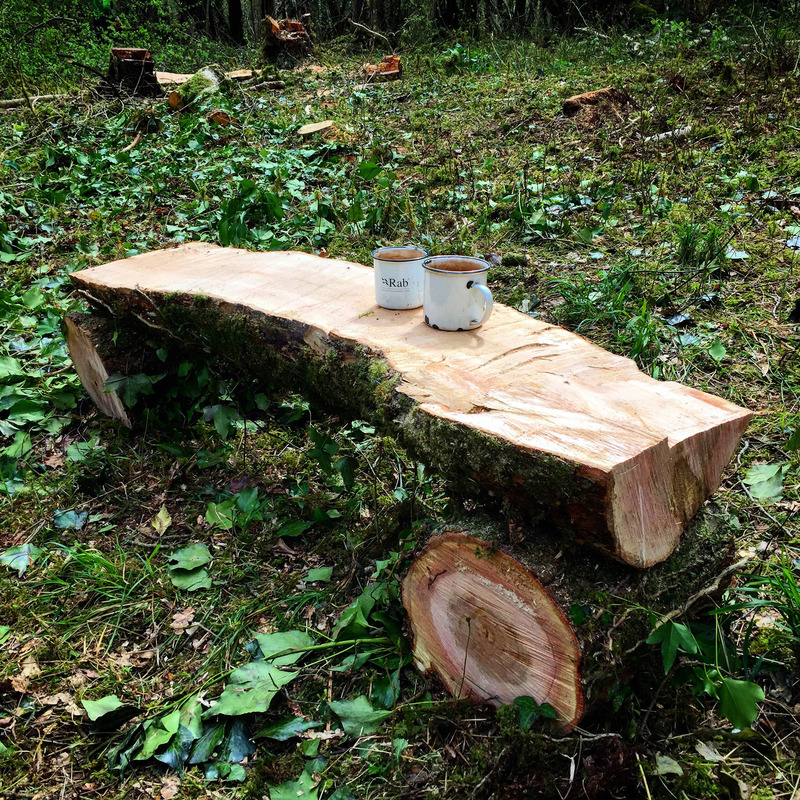 Although we are slowly bringing the woods under some management, they are still very wild and tangled, with lots of overgrown coppice as well as the oak and ash standards, making it an incredible place for kids to play with lots of nooks and crannies for dens. 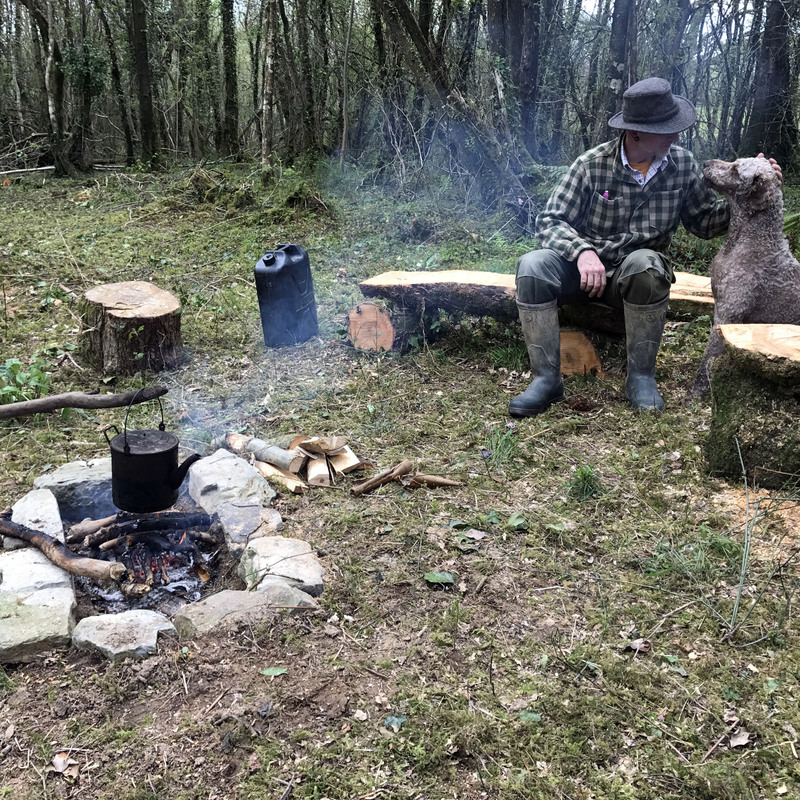 If you are interested in learning the gentle art of woodland bushcraft, then we have a fabulous friend in Dave Wildpath, who is a wilderness mentor and instructor. If you would like to book an experience with him during your stay, please mail us on [email protected] well in advance of your stay to make sure we can book him for the time required. Being dog owners ourselves, we are a dog friendly site and welcome well-behaved dogs. We are happy for dogs to be off the lead within the confines of your pitch – BUT ONLY if they are firmly under control. That means, they must be easily recalled and they must stay with the family and not wander off to say hello to anyone else on site, who may not welcome a doggie interaction. This particularly applies to protect children, who can be scared of a dog bounding up to say hello, no matter how friendly. 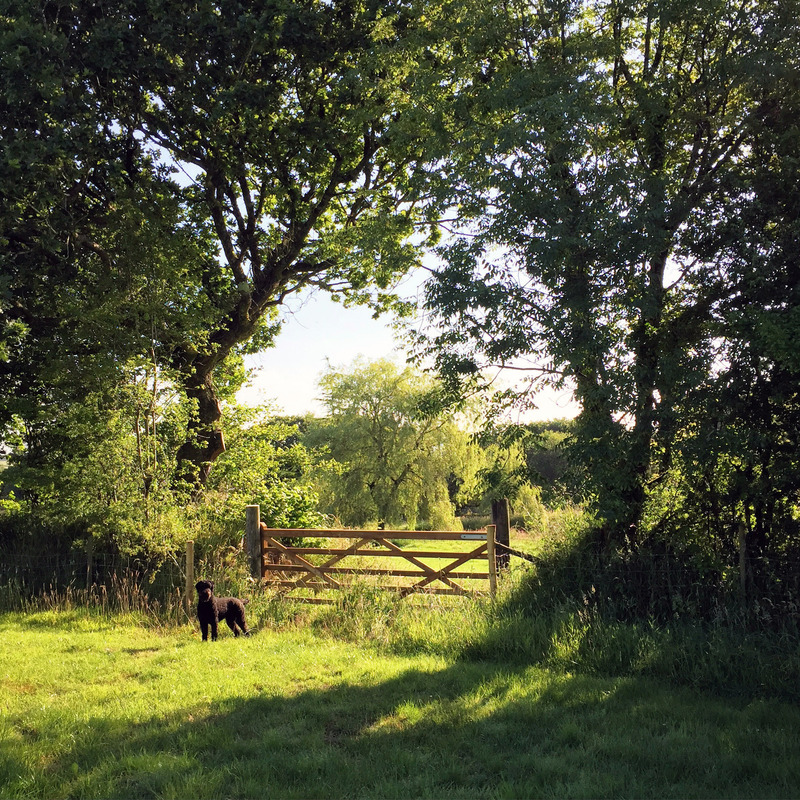 We should also point out that although our boundary fences are pretty good, it could be possible for a particularly determined dog to go and ‘play’ with the sheep and horses in our neighbours fields. 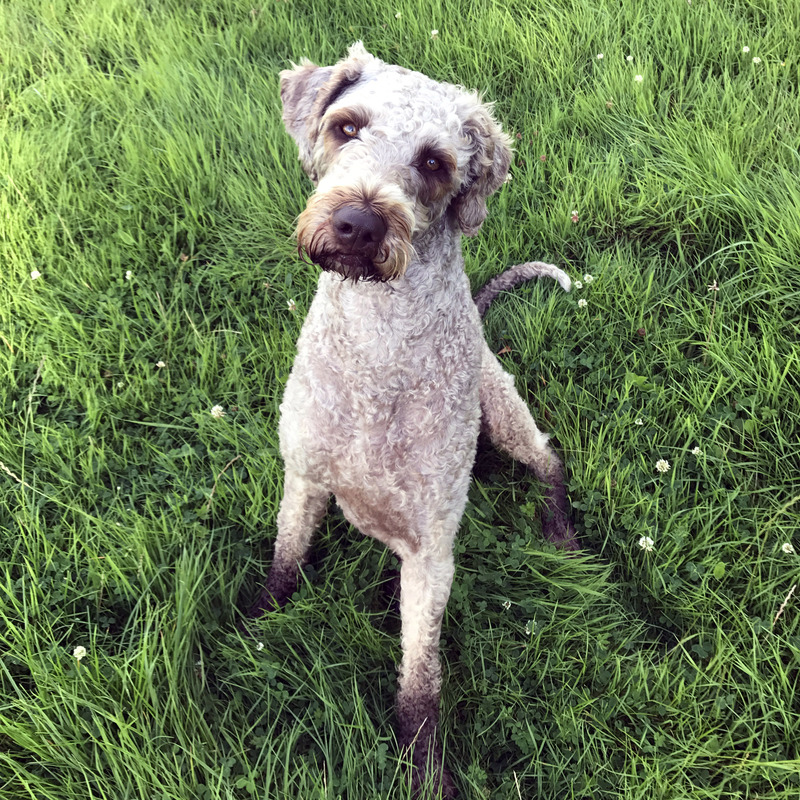 No matter how friendly your dog’s intentions are, such an incident could end up with your dog being hurt by the horses, or the sheep becoming frightened or protective of their lambs and having heart attacks. Either way, when it comes to a dog bothering or trying to play with livestock, the law is on the side of the farmer and we would hate for a beloved family pet to get itself into trouble. ask you to leave the site. but for everyone’s safety and comfort, please be advised of the following site rules. There is ample parking on site, but we don’t allow cars down to the tent pitches. We will ferry your luggage to the tent on arrival and check out. speed limit as there will always be loose animals and children to consider. No glass on site – the only exception is drink & food packaging. The tents have good quality plastic drinking glasses. the tent door please – trays and mats provided for dirty shoe storage. lanterns, but you must not have naked candles, or any other naked flames. Use of firepits must be supervised by a (reasonably) sober adult. when mixing alcohol with use of the firepits. 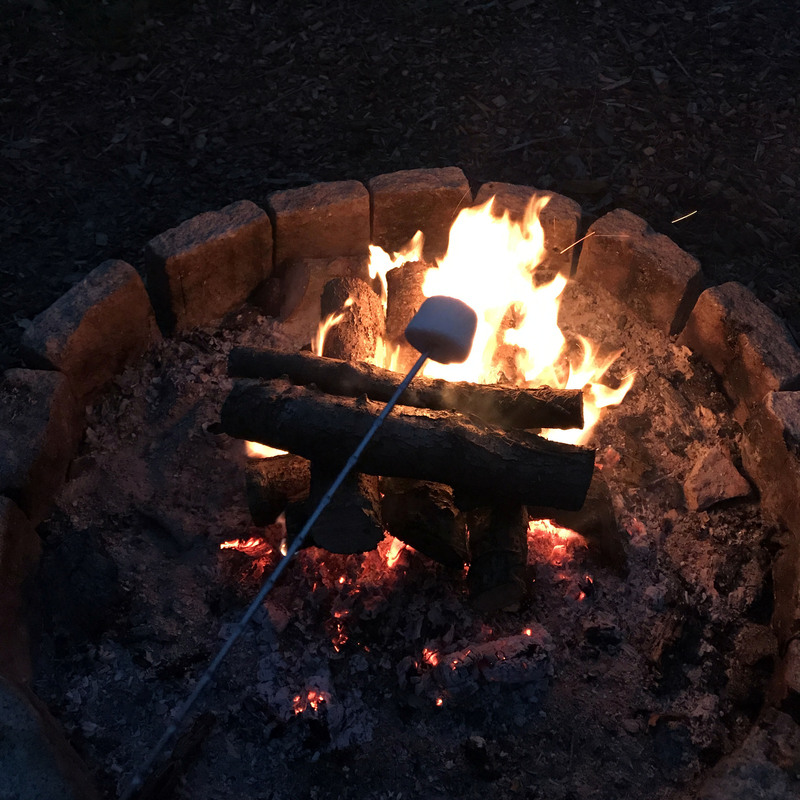 Children should be supervised at all times around the firepits. No unsupervised children around the nature pond and swimming lake. is with you. There are rescue rings at both the pond and lake for emergencies. running alongside it to assist you. which makes them impossible to exit the lake anywhere else except the pontoon. leak if damaged by scrabbling feet or sticks. located at the wash block that will be emptied regularly. expert during your stay if you are interested.